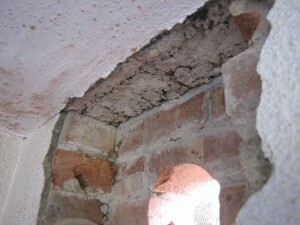 Yes, the rain came this week. 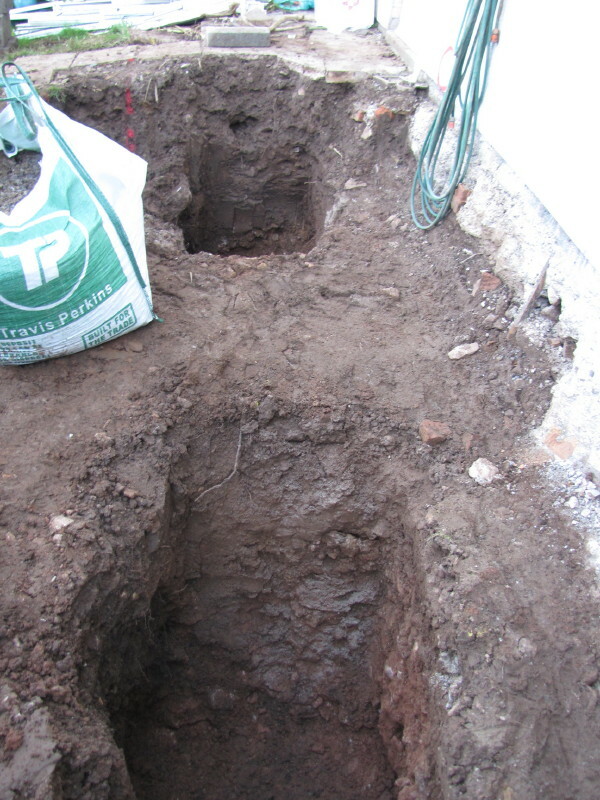 79mm fell here in 24 hours (Monday morning being the worst) – just perfect, absolutely perfect conditions to do anything other than dig the foundings for the new foundations! 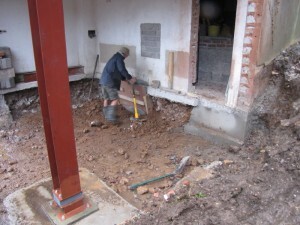 So, it has been slippy and sticky on site, which has meant slow progress. So not a huge amount to write about this week. Not to despair, the guys have progressed as well as can be expected and have got the foundings prepared and ready for the first inspection by Building Control tomorrow (Friday). 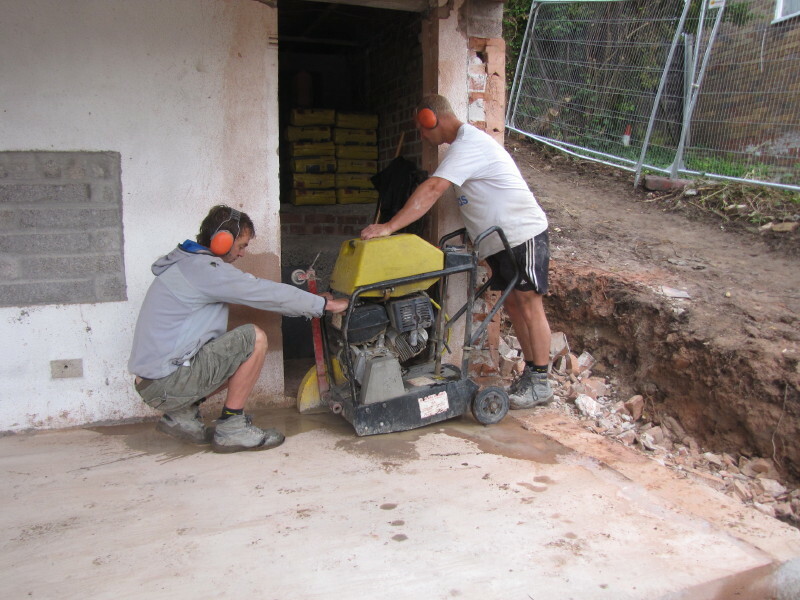 The concrete delivery is booked for the afternoon, immediately after the inspection sign off. 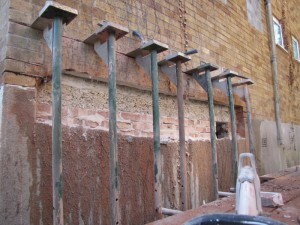 So, all being well the foundations for the rear wall will be cast tomorrow. This is good as we’re expecting a dryish weekend before poor weather resumes next week. 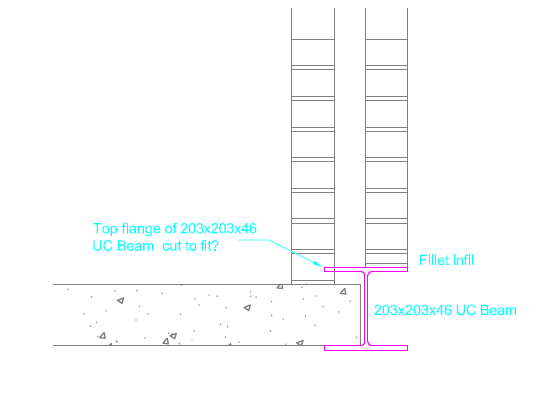 In an attempt to minimise the amount of concrete in our extra deep (1.2m) foundations (see earlier posts related to Wessex Water requirements), the design adopted uses 750 dia concrete pipes as opposed to a massive trench fill to this depth. 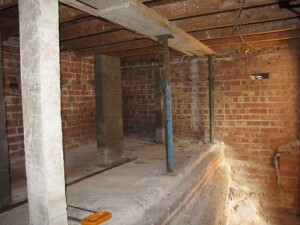 The top photo of this entry shows 2 of the 4 foundings for these pipes. 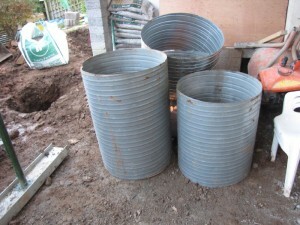 On top of these pipes will sit large lintels which we will build the walls off. 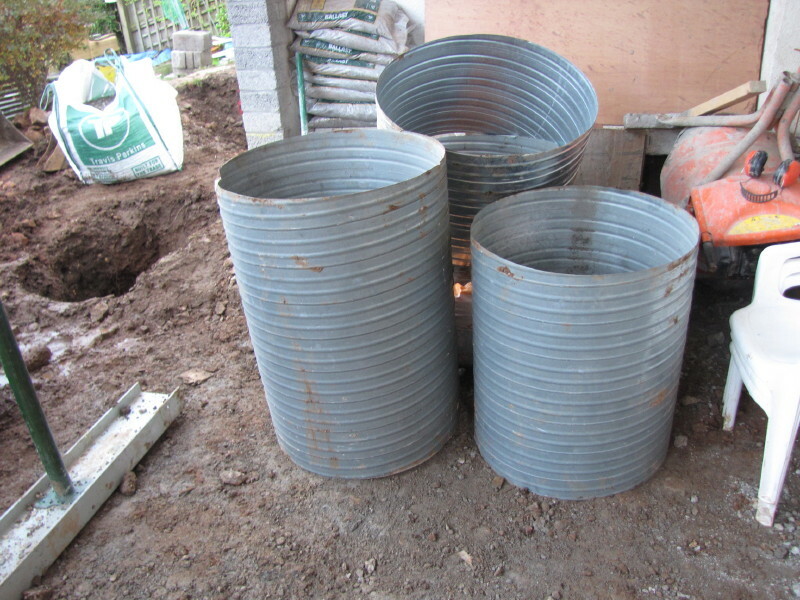 Our contractor has sourced some off-cuts of 750dia ventilation ducts (photo below) which will be perfect for casting the foundations. 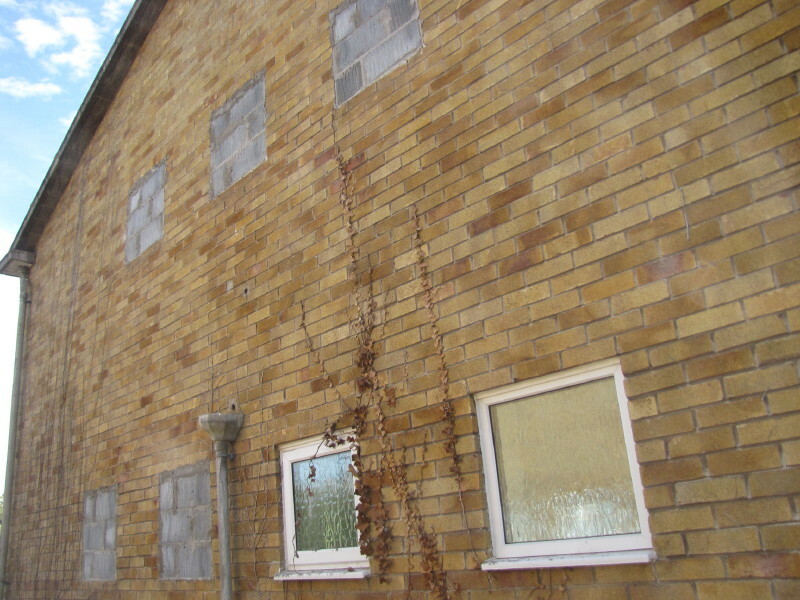 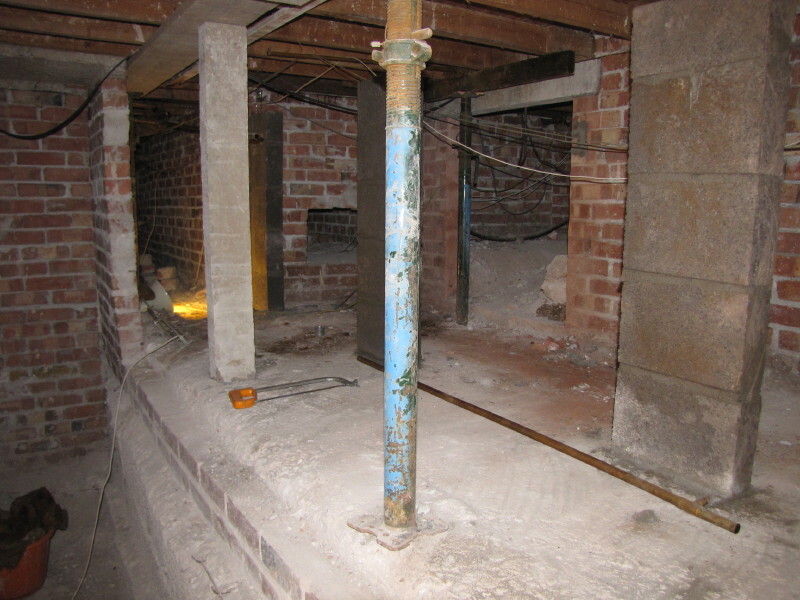 In the meantime, the underpinning has continued this week and the rear wall is now fully underpinned. This has gone well, but there’s more to be done as we work our way up the slope of the house. 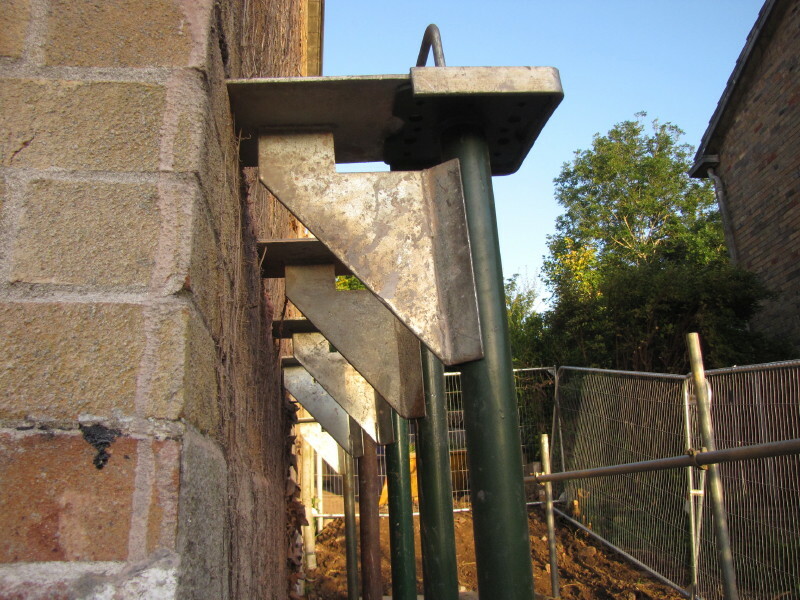 The photo below shows the, recently poured, underpinning section with the formwork and bracing (granted not the most interesting picture, but I am a bit short of visuals this week!). 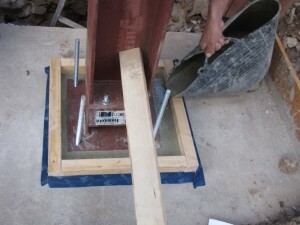 Well, first of all the base for the column needs to be prepared. 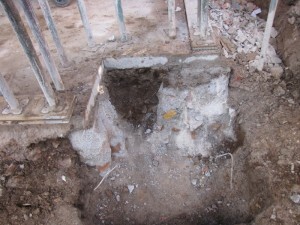 Digging down around 1 metre below the existing ground slab and cutting through the existing and substantial foundations. This new base will take the load of the whole corner of the house and needs to be pretty substantial. 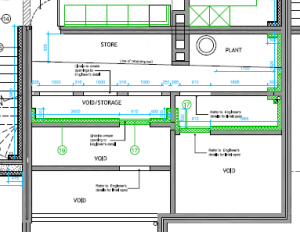 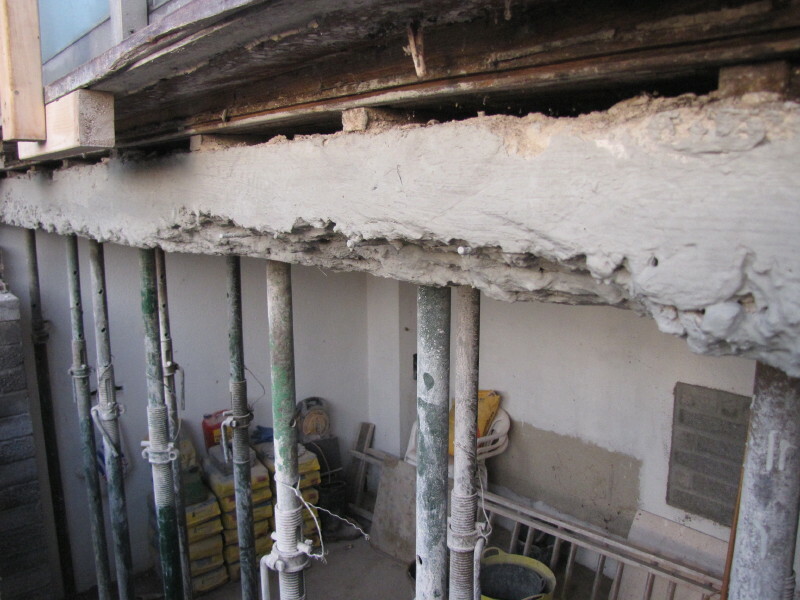 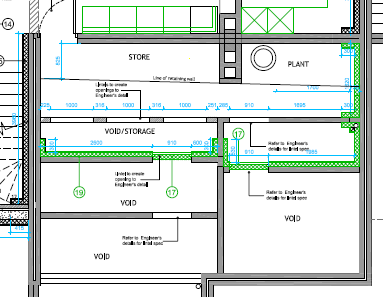 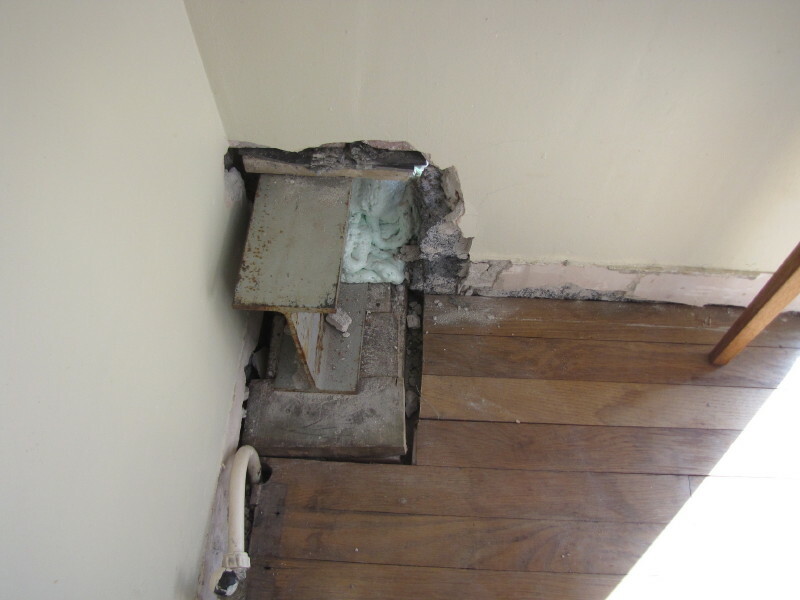 Our structural engineer specifies a depth of 400mm, but we decide to take it deeper to almost 600mm to get below the level of the existing foundations. And so once the base is cast, the new post arrive s(late again!). 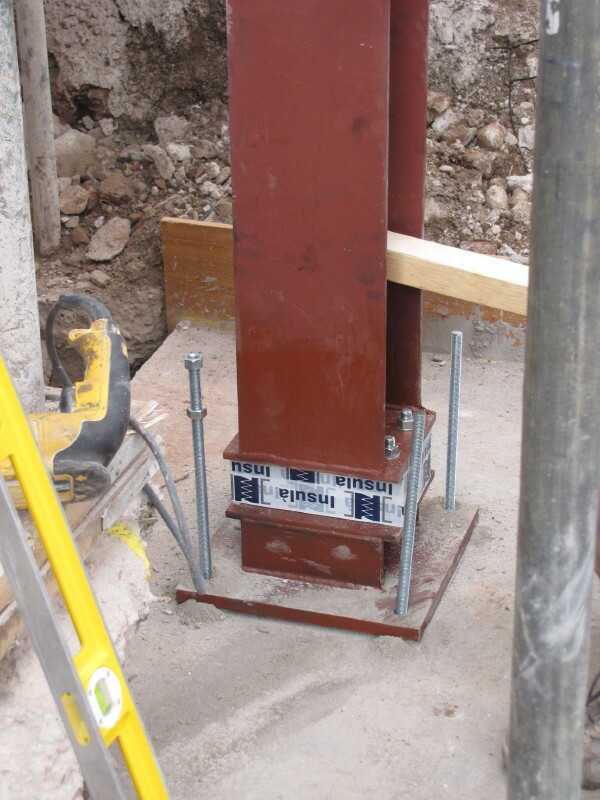 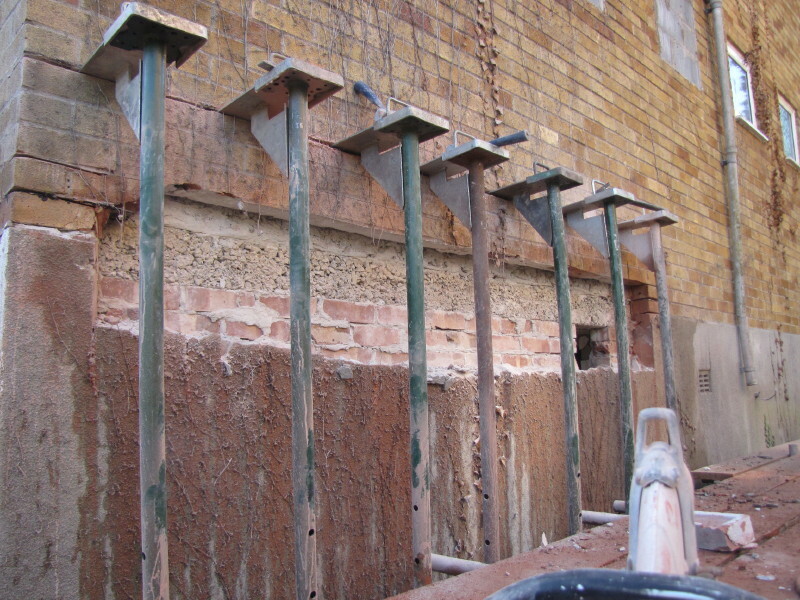 The picture above shows it sitting on the new concrete base, which has been drilled and injected with the chemical resin anchor (as used for the horizontal steels). 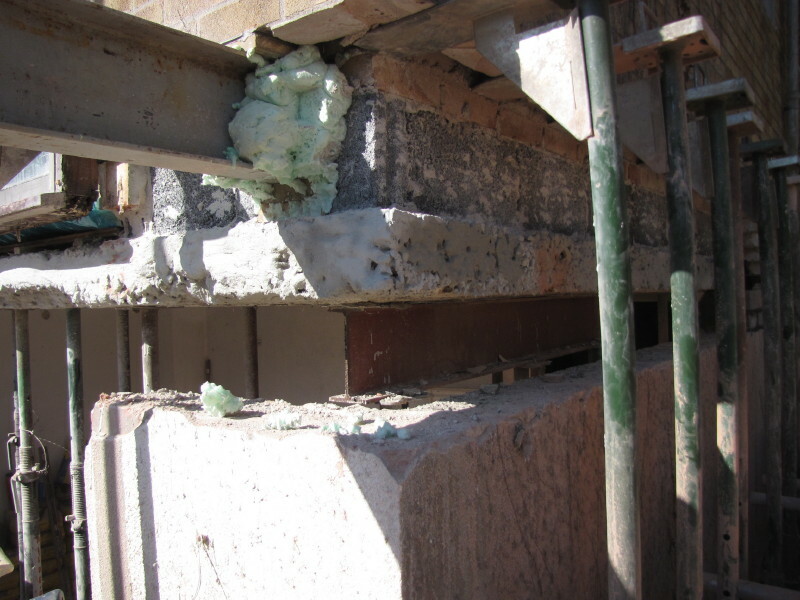 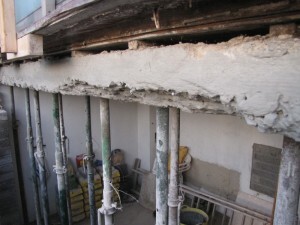 The picture also shows the thermal break used in the column. 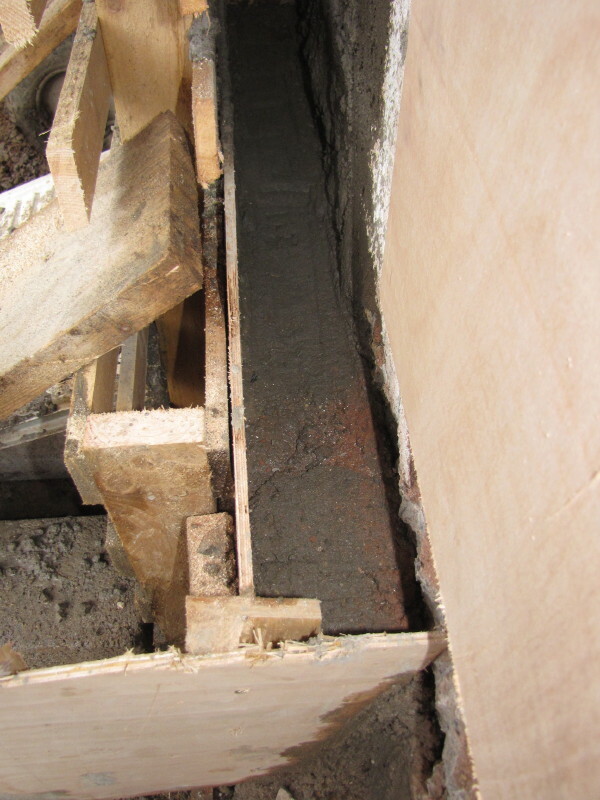 This reduces the thermal conductivity in the column by a factor of 1500 compared to having no thermal break. 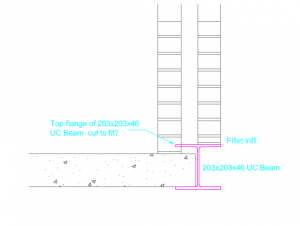 The steel column has a thermal conductivity of 54 W/m.k, whereas the break has a conductivity of 0.035 W/m.k, This is a critical element for limiting the thermal bridging through the structure. 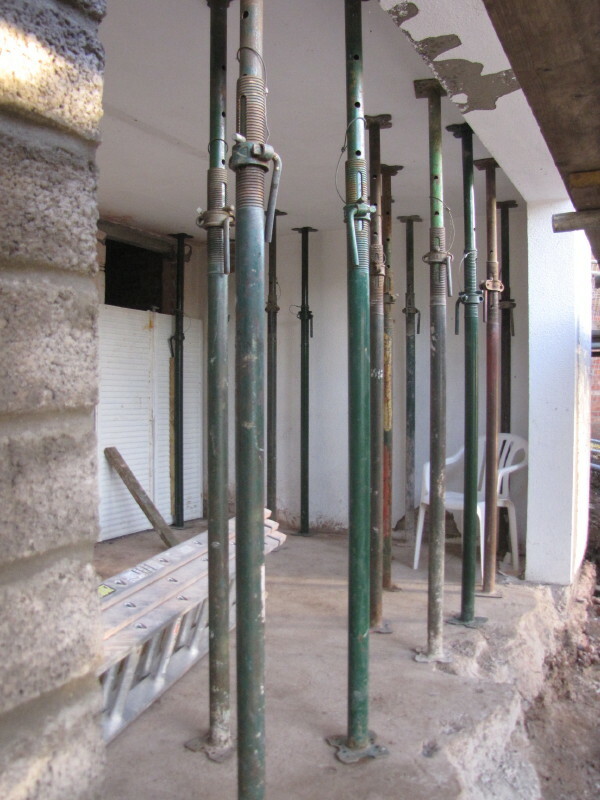 It is still a compromise: ideally we wouldn’t be penetrating the thermal envelope with structural elements, but where this is necessary, so are these thermal de-couplers. Finally, the column base is shuttered and then grouted with structural grout (as shown in the photo above). It will be bolted on Monday and the Acros will be struck. 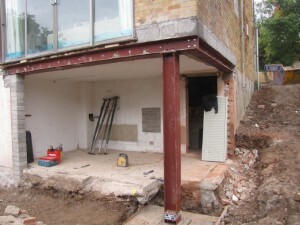 A project milestone and time for a quick glass of bubbly stuff before the guys go home for the weekend. 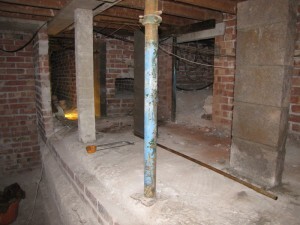 They’ve done me proud, and I can relax a little having some proper structure beneath us again! 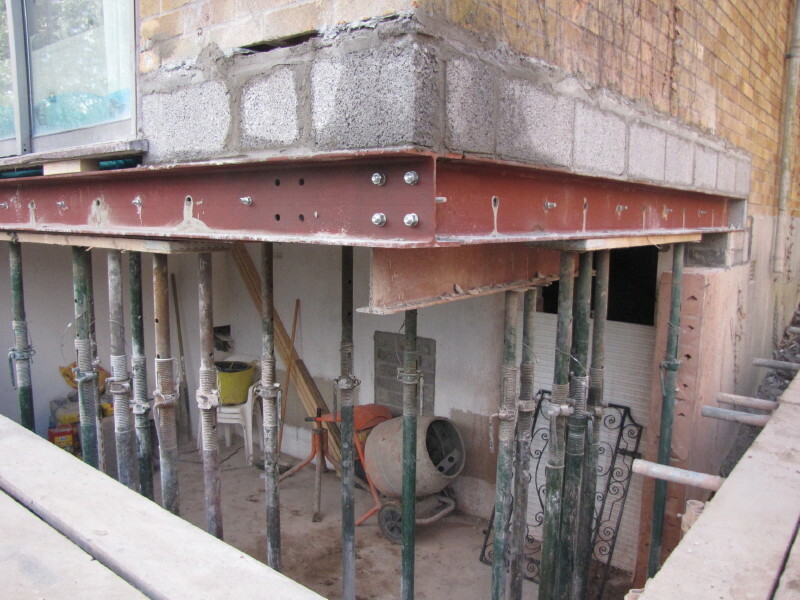 Whilst the house is temporarily supported, the horizontal steels arrive late, but the guys hang back to get the first section installed. 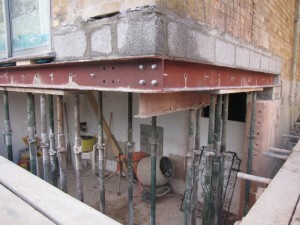 The main span across the rear of the property goes in the next day. 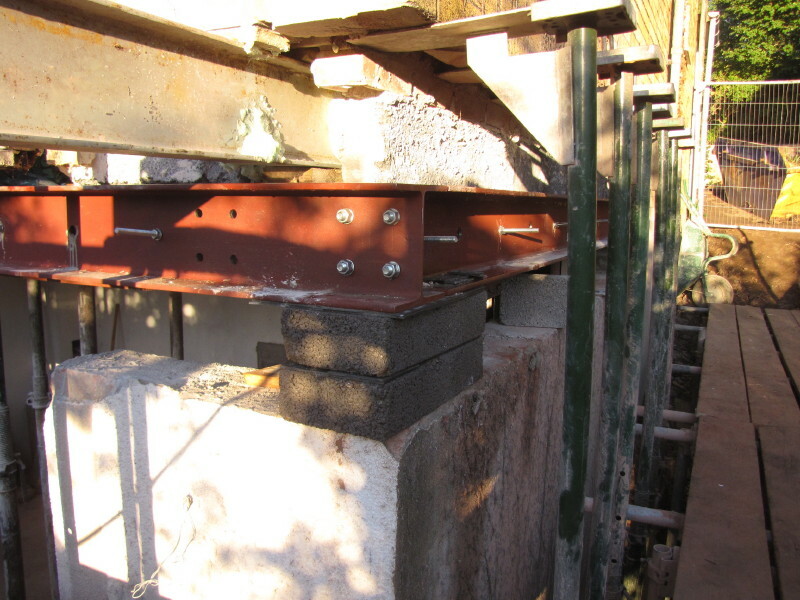 It takes three of us just to move the 200kg length, which is eventually teased into place and bolted to the shorter steel on the side wall as shown in the photo. 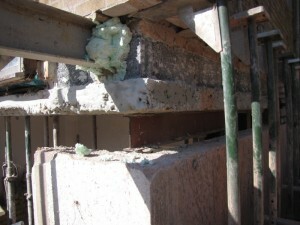 Using Hilti chemical anchor fixings, the web of the steel is fixed to the side of the slab along both steel sections as shown by the bolts sticking through the web (yet to be cut back). Next, the concrete pad for the column needs to be prepared.